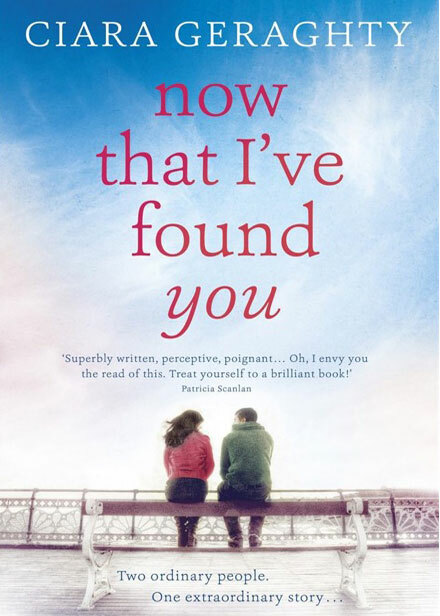 ‘Now That I Found You’ is Ciara Geraghty’s latest book. Forty-two-year-old Vinnie knows lots of things. He knows new books and school shoes are expensive. He knows his teenage daughter keeps getting into trouble and he knows his seven-year-old has wet the bed every night for over a year. What Vinnie doesn’t know is whether his wife is coming back, or if he will ever get better at single fatherhood. Ellen knows that what happened in the accident was all her fault. She knows she’s too scared to get behind the wheel of a car ever again and she knows that some scars are harder to hide than others. What Ellen doesn’t know is how to move on. And she doesn’t know anything about Vinnie, the taxi driver who drives her to physiotherapy every week. And neither of them knows they’re going to change the other’s life forever. ‘Now That I’ve Found You’, sees the welcome return of Irish author Ciara Geraghty. The story is about a couple who meet and are able to be there when things are hard and the sweet cover of the book empathises the poignancy of this Irish tale. Vincent is a taxi driver who meets Ellen, he meets her weekly to bring her to her physiotherapy meetings. They have a professional relationship, where they don’t interact until one day Vincent has a panic attack and Ellen takes him to hospital. Appreciative of her help, Vincent thanks Ellen and their new friendship begins, both are lonely people with mutual problems in common, they find a companionship and an understanding in one another. The story is primarily seen through Vincent’s eyes, a single parent struggling with his teenage daughter who is rebelling against and his sweet little boy who is doing a countdown until his Holy Communion convinced that his mother, Paula will return after disappearing months ago. The chapters with Ellen are comprised of letters that she writes to her husband Neil, we don’t know where he has gone in the story but under her doctors advice, she tells Neil her thoughts and tries to move on with life. The story is about mental health, the issues of bipolar disorder and how it can go undiagnosed and the controversy that surrounds the illness. I loved the main characters, both quiet and troubled, I thought they complimented each other perfectly. Vincent is a gentleman, strong and silent, he works hard at being both father and mother and finds it difficult to accept that his little girl is growing up and this results in many arguments over the course of the story. Ellen spends most of her time alone, quiet and with her thoughts, she reminisces on the past and with her new friendship Vincent, we see her come alive and acquire a new passion in life. As the story is quite a sweet but sad one, Ciara was included some gentle Irish humour into the tale with Vincent’s best friend and work colleague, Kenny, a trendy man with an eye for fashion and the ladies. There’s an genuine friendship between the two men as Kenny was aways there for him particularly after Paula disappeared. Vincent’s mother is also quite the character, always on the go and helping out at local charity events, she refuses to let her age slow her down and is a huge support for Vincent and his children. A beautifully written story from the start, ‘Now That I’ve Found You’ is a heartwarming story of friendship and starting over. Filled with humour, love, fun characters and a dash of romance, I couldn’t put it down. You can buy Now That I’ve Found You from Amazon and is available to buy from good bookshops.